So, here we are at step two of the Cure the Paper Organization Blues, and already I’m changing things up. We already set up a plan for handling incoming papers and gathered up all the papers from around the house that need organizing. But before we can dive into the task of sorting and purging, we need a plan for where we’re going to put all that paper when we’re done. I don’t know about you, but the less I have to handle the papers the easier this job is going to be. So today we’re going to talk about how to make a plan for our paper storage. Over the years I’ve looked into many ideas for how to store papers and I’ve come to the conclusion that there are really only three categories, or levels, of paper storage that need to be considered. We’ve already tackled the first level when we set up our system for handling incoming papers. This level is very temporary. It is just a holding place for papers until we act on them and/or file them away for later. The next levels of storage are where we put the papers once we’re done with them. These are the two levels we’re going to talk about today – our short and long-term paper storage. It is always a good idea to check with your provincial/territorial/state and federal governments to be sure you’re keeping things for the right amount of time. I found the following two articles with general guidelines on what to keep and how long to keep it for but make sure you double check that info. My advice – if you’re not sure, keep it! It may go against normal organizing advice, but in the case of papers and documents, I feel it’s better to err on the side of caution. How much you need to store long term, depends on your own individual circumstances. Once you figure out the what you can determine the where. Most of us won’t need to access these papers on a regular basis, so we can easily store them somewhere that is out of the way, but there are many ways to store these types of papers. I use an accordion file box to store all our important and long term papers. It works really well for our family and our needs. What I really like about this system is that it is flexible and if we need more room I can add a second one if I need to. It’s also portable, so in the case of an emergency (I live in an earthquake zone) I can just grab and go and our important files are with us. The options are pretty limitless when it comes to storing your papers. As long as you can find them when you need them, any solution you choose will be fine. Are you filer or a piler? We touched on this last post. 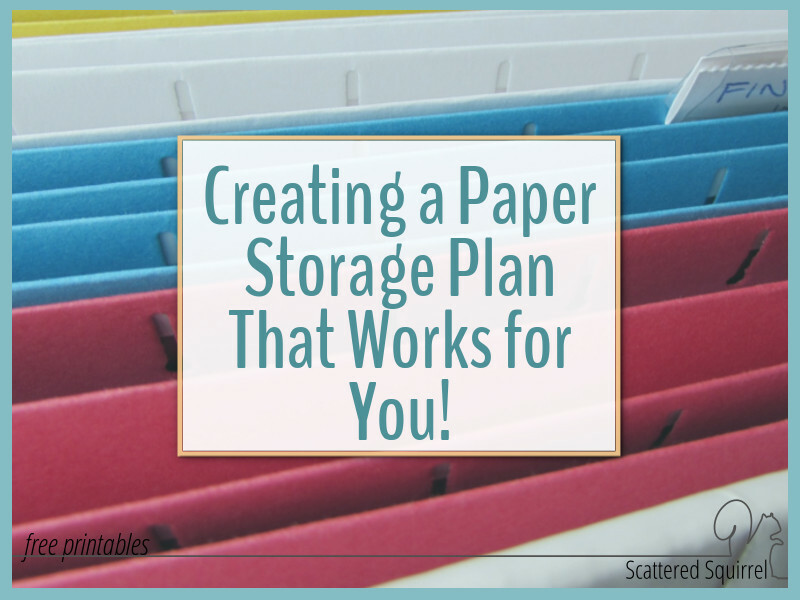 How you naturally deal with paper will play a big role in how you create your storage systems. For me, the only real filing I have to do is for my long-term storage. It works for me because I really only have to touch those files once or twice a year. How many categories/sections will you need? There are a ton of articles and videos out there to help you figure out what categories and subcategories you need for storing your papers (if any). I keep mine really simple, but other people need more structure. My favourite resource for paper organization inspiration is Alejandra’s Home Office and Paper Management videos. 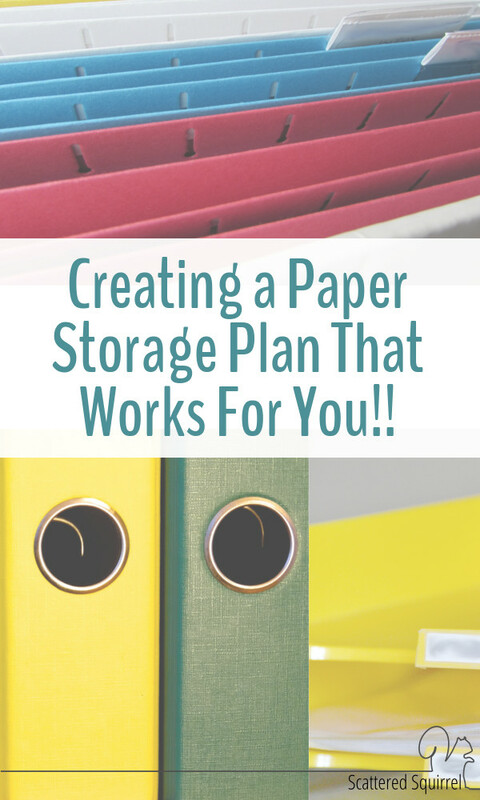 The world of paper storage and organization can sometimes feel like we need to force ourselves to adapt, which often leads to systems that stop working or hours spent getting caught up on our filing. There are a few tricks I’ve adopted over the years to help me work with my piling nature and I wanted to share some of them with you. Large envelopes work wonders for long term storage. You can use one for each category and slip the documents inside. Then you can pop the envelopes into a bin and it’s easy to find them when you need them. Binder clips and folders work really well together. I used to keep a stack of folders on my desk to help organize my papers. They were kind of like make-shift paper trays. I used binder clips to keep the papers clipped to the folder so they didn’t fall out when I moved them. Binder clips with labels help keep piles neat and make it super easy to find what you’re looking for. You don’t have to buy fancy binder clips, just use some masking or washi tape around one of the prongs and a permanent marker to write on them. Paper sorters/shelves can be labeled like files and used to keep your papers organized without sticking them in a file. You might need to get a little creative and think outside the box, but you can create a system that will work for you. Take a few minutes to jot down your ideas for your storage solutions. I like to make two lists, one for short-term one for long-term. I start by listing my ideas for how to store them. Then under that, I create a list of categories or subjects I plan to organize my papers into. That way, when it comes time to sort, I only have to sort once. It’s important to get our ideas out of our head and onto paper so we can fully map out our paper storage plan. To help I created a printable to help us organize our papers before we start sorting. We can create our plans for short and long-term storage and help make the sorting process easier. As you can see I kept it super simple like always. 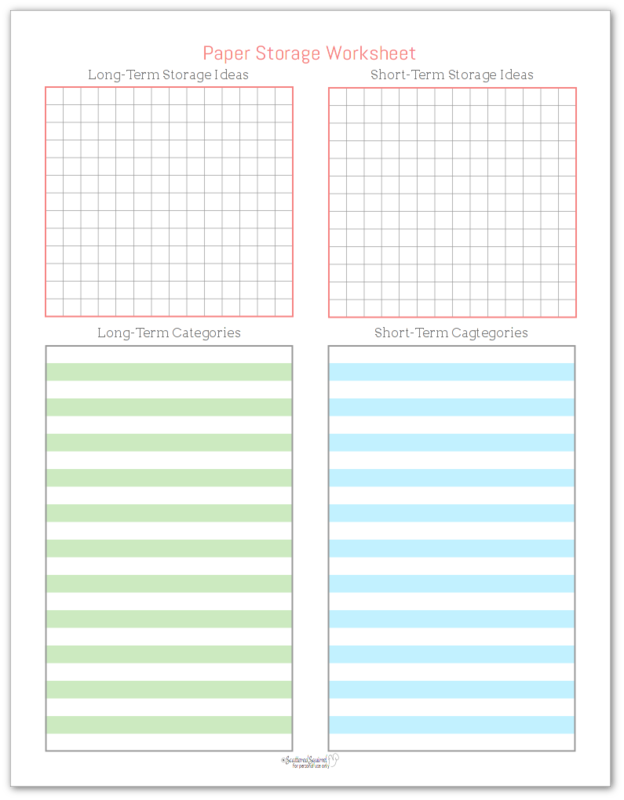 One column for each with a space for storage ideas and a space for categories you plan to organize your papers by. 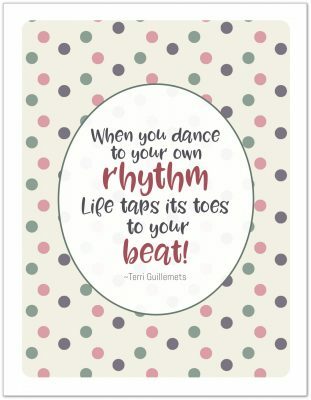 As always, to snag a copy of the printable for yourself, simply click the picture and you’ll be taken to the PDF file. No matter how hard we work at going paperless – even if we scan all our long-term documents into our computers, we still a place to store the originals. With a little thought and planning, we can create a paper storage system that will work well for us for years to come. Now it’s your turn? Do you have and tips for suggestions to make paper storage easier? Do you have a system that is working well for you? Drop a line in the comments below and let us know.